There's always something happening in tech, whether it's a new phone rumour or a new app, and thanks to our friends at TechRadar we can make sure your finger is always on the pulse – here are five top breaking stories we've noticed over the past day or so. The Samsung Galaxy S9 and S9 Plus rumours are coming thick and fast, because the official unveiling is expected to be at the Mobile World Congress show at the end of the month. The latest tidbit to leak out is the size of the batteries for the S9 and the S9 Plus, reportedly 3,000mAh and 3,500mAh respectively – that's exactly the same as their predecessors, so let's hope Samsung can improve the battery life some other way. Sorry, fans of Windows 7 and Windows 8 – the next version of the juggernaut office suite that is Microsoft Office will be a Windows 10 exclusive, forcing you to upgrade if you haven't already done so. That's been confirmed by Microsoft in a blog post, a sign of the renewed focus the company is putting on its latest and greatest OS (and to be fair, it is very good). Office 2019 should be shipping sometime in the second half of the year. The humble dashcam can be useful for claiming money on insurance after an accident or in capturing some funny on-the-road footage that later goes viral on YouTube and earns you millions. Whatever your aims, the Owl Car Cam promises to fit the bill: it comes with a 4-megapixel camera sensor, constant connectivity to your phone (to warn you if your car gets dinged in a parking lot), and more, though for the time being it only works with iOS. 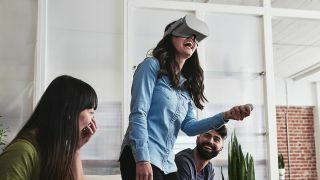 We just got sight of some new photos of the Oculus Go – that's Facebook's upcoming VR headset that's fitted with smartphone-level electronics on board, so you don't need to connect it to another device, and can roam around freely in your own immersive world. The leaked images line up with the official pictures we've seen so far, and should keep you going until the device actually goes on sale (which should be in the next few weeks). Red Dead Redemption 2 is undoubtedly one of the most anticipated games of the coming year, so it's a shame that developer Rockstar Games (of Grand Theft Auto fame) has announced the game's launch has been delayed to 26 October from "spring 2018". At least it should mean we get a better, more stable game as a result, though Rockstar hasn't said exactly what the problem was in regards to why the launch has slipped several months.